Flashy indigo blue, yellow, green-gold, grey colored Labradorite crystal chip bracelet strung on 6 inch elastic cord from Africa. Labradorite is a highly protective, a bringer of light and mystical stone. Labradorite deflects unwanted energies from the aura and prevents energy leakage. Labradorite is a stone of esoteric knowledge that facilitates initiation into the mysteries. 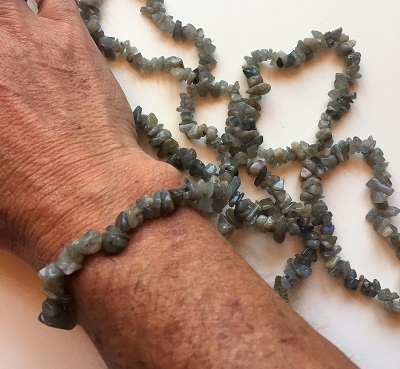 Labradorite aligns physical and etheric bodies, stimulates intuition and psychic gifts and allows for the understanding of messages from the unconscious mind. Labradorite helps one notice the moments of synchronicity and serendipity that occur in life. Labradorite is an excellent tool for the removal of disillusion. Labradorite is a stone of transformation preparing body and soul for the ascension process so one may follow their divine purpose. 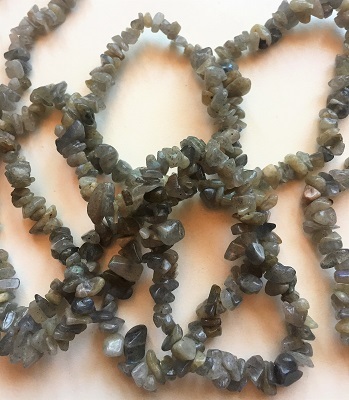 In healing, Labradorite helps to relieve stress, regulate the metabolism, treat disorders of the eyes, brain, colds, gout, and rheumatism, balances hormones, relieves menstrual tension and lowers blood pressure.